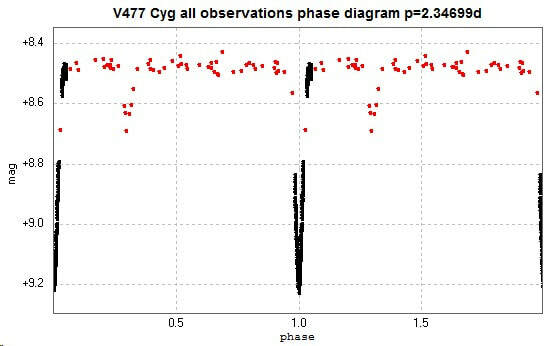 Light curves and phase diagrams of the EA type eclipsing binary V477 Cygni / V477 Cyg. 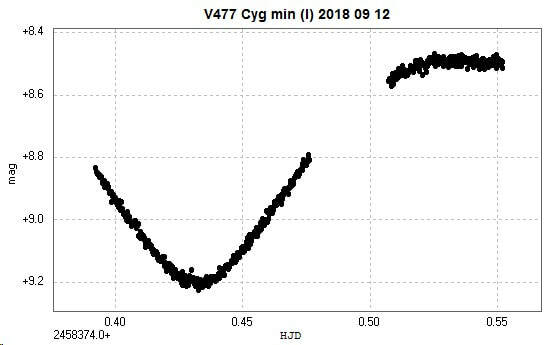 A primary minimum was observed with the 2" Titan at Somerby Observatory on September 12 2018. The 576 images were unfiltered. 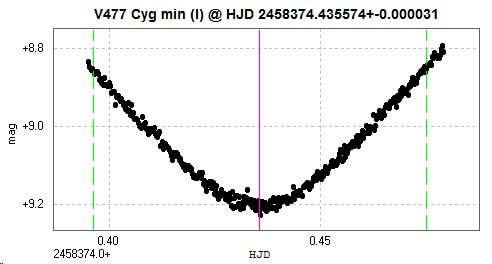 The following time of minimum was calculated in Peranso; HJD 2458374.435574 +- 0.000031. 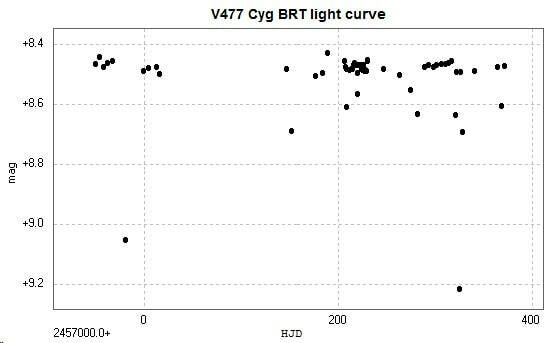 A previous series of observations had been made with the now decommissioned Bradford Robotic Telescope (BRT - website no longer available). 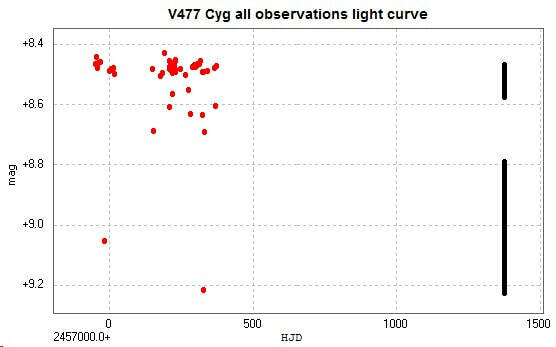 The 59 images taken between 2014 October 18 and 2015 December 4, through a three colour green filter, generated the following light curve and phase diagram. The secondary minimum occurs at phase 0.3 due to the eccentricity of the orbits of the system. 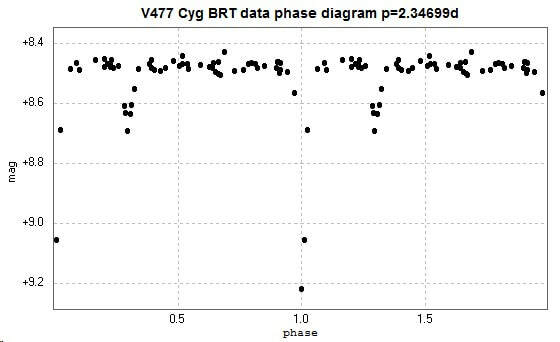 Combining both the above sets of data leads to the following light curve and phase diagram, the BRT observations are in red and the Somerby observations are in black. The following diagram is a close up of a single phase. There is considerable o-c activity in this system (Kreiner). 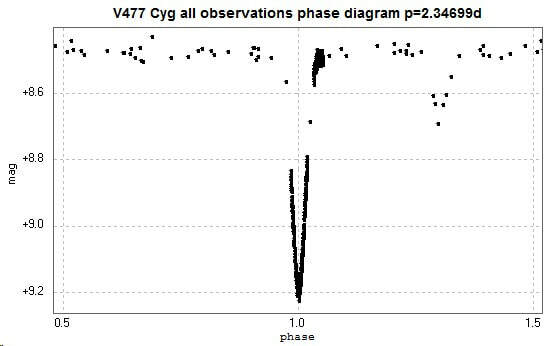 This is due to the apsidal rotation of the highly eccentric orbits, see, eg, Deǧirmenci et al 2003.